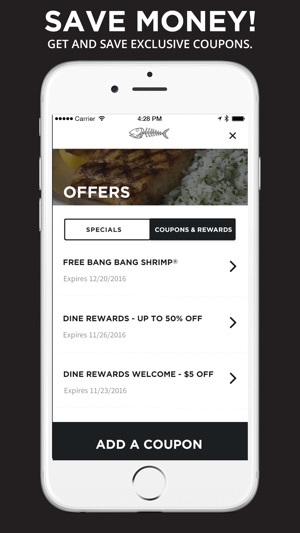 The Bonefish Grill app is the fastest, mobile way to enjoy fresh fish and seafood. Plan ahead, find your nearest location, make same-day reservations and browse the menu. You can even save money in our Offers section where you can receive and collect offers and rewards. Also, save time by paying directly from the app when you're ready. 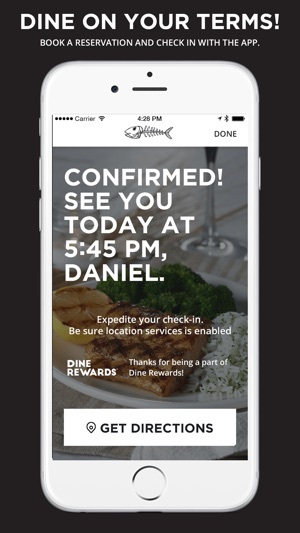 The Bonefish Grill app puts you in control and lets you dine at your own pace by simplifying the dining experience. 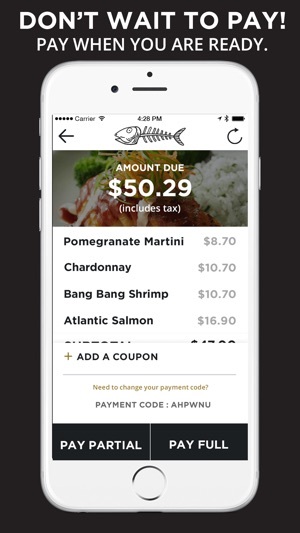 The Bonefish Grill App uses data encryption to protect your financial information and card data is never stored on Bonefish servers. The Bonefish Grill App uses GPS to enhance the user experience by prompting you to check in when you arrive at the restaurant. Note: Continued use of GPS running in the background can dramatically decrease battery life. I originally downloaded this to make my reservations, which was great. I added Dining Rewards with no problem and it keeps track fine, and even tells me about discounts I'm entitled to. And as a customer who always pays with a gift card, it was perfect! In the past I've had to send my phone away with the server (always a little scary) but the app showed me my bill, let me input the card, and even add the tip from the gift card. It was a little slow, but could have been due to having one or two bars. My only request for an enhancement would be the ability to add my gift card to be stored in the app so I didn't have to type it in at the table. But overall I'm very happy with it! Bonefish is one of our favorite restaurants. User beware... I was looking forward to paying with the app, but what a mess it caused. I had carefully pre-entered credit card info, but the app gave an error, that my card info was wrong. I entered info again while sitting in the restaurant, it said error, bad info... tried a 3rd time, same error. I showed this to the server (who had no clue you could even pay on the app) gave my (same) card to server to pay. Next day—card shows all FOUR charges. So... guess what, there’s no tech support for the app! And the customer service phone # for bonefish just goes to a generic voicemail right away, no way to reach a human. So while I’d love to use the app to pay, no way will I try it again. The only drawback for me is the emailed receipts have all the alcohol proudly listed. As a business traveler I wish I could get a "business friendly" receipt with just the total amount paid. © 2018 Bonefish Grill, Inc. All Rights Reserved.